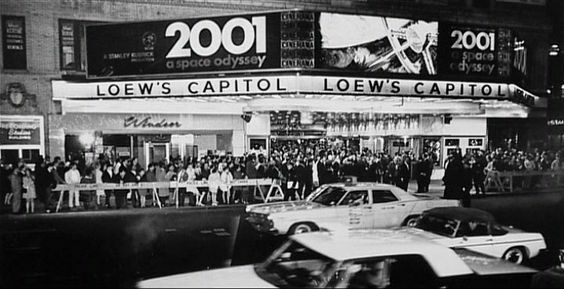 This Easter its fifty years since the classic space film, 2001: A Space Odyssey had its world premiere at the Lowe Theatre in Washington D.C. Despite being an American movie, 2001 was in fact one of a number of US films entirely made in England. Hence the credits: Made at MGM British Studios Ltd. Borehamwood, England. The UK premiere was meant to take place on 11 April 1968. ironically London would have to another four weeks for its share of 2001 when the film was finally premiered here on 1 May 1968. 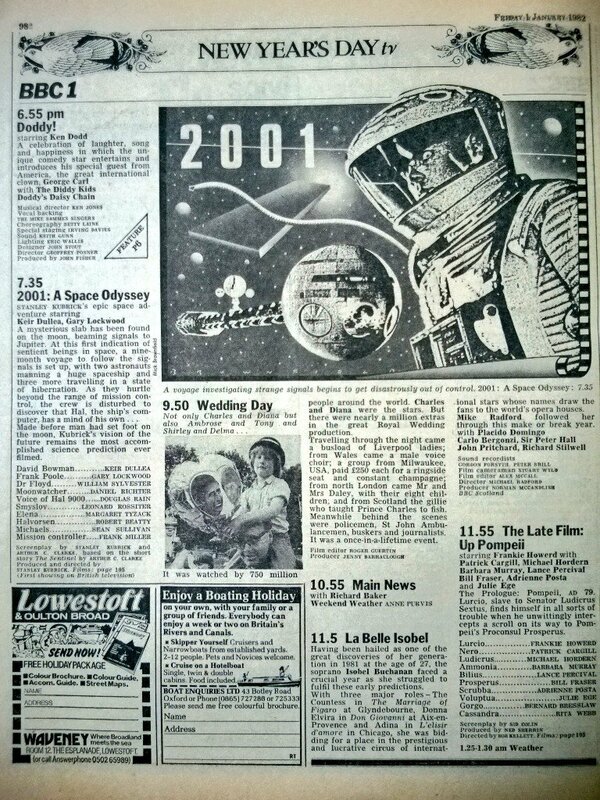 The US premieres of 2001: A Space Odyssey were on the 2nd, 3rd and 4th of April 1968. Macy’s began showing normal performances at six of its venues from 3rd April. Most sources claim the Loew’s premiere was on the 4th April but this is wrong. News adverts show it was on the 3rd. I have to question the April 11th date given for London as it is clear this was on 1st May 1968. Similarly quite a few sources have the UK date wrong, some saying 10th or 15th May. Evidence shows it was the 1st May, followed by public performances at London’s Casino Cinerama. 2001 is a very difficult film to write about because very little has been left unsaid about it. Even in the early days of the Internet the web was awash with pages dedicated to 2001. The scope and depth of writing on the film is huge and practically every single aspect of the film, the sets, the scripts, the plot, the characters, the monoliths, the apes, the Star Child, the author/screenwriter Arthur C Clarke, and its famous director Stanley Kubrick, have been explored to such an extent there’s very little that’s been missed out in terms of what it all meant. Yes there was more to the film but one had to go and read the relevant feature on a different page of the Radio Times! Were the BBC right in describing the film as such? Was it really a tale depicting a space voyage disastrously out of control? I don’t think that was the intention as Kubrick had intended. It was more about the schism between man and machine, plus humanity’s acquisition of intelligence leading it to destinations unknown. One wouldn’t describe the ending, the hotel room, the Star Child as a disaster, more of a cautionary tale with some possibly positive elements. Later the film rights to 2001 were acquired by Channel Four who showed it, quite bizarrely as part of a series of B movies under the banner ‘Film Nightmares.’ I cant imagine how the channel thought 2001 was a nightmare unless the person or persons selecting the film had held a rather poor opinion of it. Of the film itself, Wiki says, “By the time shooting began, Kubrick had removed much of the dialogue and narration; what remains is notable for its banality (making the computer HAL seem to have more emotion than the humans) juxtaposed with epic space scenes.” There was probably about thirty minutes of dialogue in the whole two hours plus of the film though some sources say 25 minutes and others forty minutes. The music by Strauss was dominant and many of the main plot scenes had very long establishing shots (accompanied by Strauss’s music) such as those of the unfinished space station and the spacecraft making its approach and landing, the trip to TMA-1, and of course the famous Star Gate sequence. On a small screen the impact of these was not appreciated however in wide screen (70mm or Cinerama) the sensation was huge, and it was a major draw of the film. Despite numerous initial criticism, the critics were confounded when school buses began drawing up in the first few weeks of US showings, with huge numbers of schoolchildren seeing the film. No doubt it was the visual impact that endeared many. The bastardisation, complete with sloppy splices and uneven pacing, is now being viewed by even more confused audiences than met the original. But the most confused of all is MGM, whose lack of artistic faith in its own film led it to cut what it couldn’t comprehend, thus destroying what it hoped to save. As no-one has been able to view the film in its original format since practically day one, its been very hard to know what is missing and whether any of the story was compromised. Kubrick himself made sure what wasn’t needed was destroyed including the famous sets. There are numerous photographs in existence taken personally by the film crew and support staff of the filming itself, so there is some idea of the extent of the cuts and of the work that went into making the film. Interestingly Kubrick was sued by the National Air and Space Museum in Washington. It sought damages of $1 million against Kubrick/MGM for breach of contract related to several sets from 2001. The museum says it paid $14,000 for the sets which were to be sent over from England and exhibited in a new building. MGM informed the museum on 23 September 1967 the sets were not available. On one level it seems they are saying this is the original shown on a new print. But then they say there are no ‘revisionist edits.’ Plus its ‘unrestored.’ Means it hasnt been restored! There’s one and half months before we find out exactly what they mean! Some of the DVD releases do have what we can call a director’s cut. Its not exactly scenes that have been restored but how the film was originally presented. (Could be what they are showing at Cannes?) This included an overture before the film actually starts, plus an intermission, again with an overture. The DVD of 2001 that I have has this as I would imagine quite a few others. Apart from an extended sense of presentation, it doesn’t really tell anyone what the film was originally like as no scenes are restored. The film’s current make-up has elements of these discarded scenes. Astute observers will notice the hotel room scene where clothes laid out on the bed. These Bowman later dressed in but that scene was cut. I saw several of the iconic sixties blockbusters at the cinema in their first year of showing, but 2001 for some reason was missed out. I do remember other school kids discussing the film, saying how fantastic it was. It was not until the film was premiered on British TV for the first time that I saw it. One of the most interesting aspects of 2001 at the time it was being made, this being 1966, was the fact no picture had ever been taken of the whole planet Earth from space, let alone the moon, Jupiter, Saturn. No-one knew what it was like out there. Some grainy pics were acquired of Mars by Mariner 4 in 1965. Yet just one picture was managed of the earth from the moon by Lunar Orbiter 1 in 1966 depicting a fuzzy, grainy half-lit planet. The two pictures above alone shows its actually very hard to capture the essence of what it is like to be in space and that alone shows the ingenuity needed to make 2001: A Space Odyssey. The film was originally planned for release in 1966. This was put back constantly. Kubrick had enormous technical problems with the film. He didnt want some cheap Buck Rogers adventure. It had to be as real as it possibly could. Ultimately it was very late – and very expensive too. Instead of a budgeted six million, it took well over ten millions dollars to make. If one watches the film’s space scenes, including those around Jupiter, its in many ways certainly better than the images we have from Voyager. Certainly the latter are very high res but they do not convey the unique sense of being out there in the way Kubrick managed. The ‘location’ shots taken showing the going-ons between Jupiter and its moons was done in a detail no-one had ever managed before. Leaving aside the film’s special effects, I don’t think I have even seen Kubrick’s film discussed in the the way I am about to do so. As a prologue of sorts, one can consider the Radio Times from 1982 that I mentioned earlier. Was it really was a disaster that struck this mission investigating mysterious signals being beamed to Jupiter? In my view the film seems to be about having leaps of faith. The ape being inspired by the monolith is a small one. The biggest leap of faith of all however in my view is the pod bay doors. There is some accidental interpretation here, and I wonder if Kubrick himself even saw it that way. Bowman pleads with Hal to open the pod bay doors so he can re-enter the space ship. Hal refuses. Bowman then realises he is faced with an existential choice. Either die inside the space pod or run the risk of dying in space in order to gain a back entry into the spaceship (this is via the emergency air lock.) Failure was extremely high. Bowman could miss the air lock control and be sucked back out into space. He had just a few seconds to hold his breath before the vacuum of space sucked the life out of his body. He needed split second thinking, there would be barely time to think. No second chances the very instant he was ejected from the space pod. Bowman has to prove he can think beyond the usual limits of human cognition. Merely simply requesting the pod bay doors be opened was not enough to gain access to these higher forms of intelligence, in fact one had to show elements of possible higher intelligence themselves. One can liken the opening of the pod bay doors to ‘open god’s way door HAL.’ The deity in question actually being a higher being. Someone with bad faith? It has to be HAL of course! In some ways I think Hal was aware there could be huge risks in humans coming face to face with super-intelligent beings. Stopping the astronauts’ progress was the only sensible move. An act of bad faith. But the pod bay doors episode inadvertently happened to be a test. Having surpassed this test and shown these higher beings Bowman was indeed unusual. In disconnecting HAL, Bowman showed there was no obstacles of any sort. Any attempts to stop him ceased and he was allowed to investigate the monolith near Jupiter. The rest of the story then makes sense – the star gate, the strange room, and the star child. Had Bowman not excelled this obstacle course, there would have been no star child. Its taken me quite a few screenings of the film (both TV showings and DVD) to even grasp fully what the film was about and even add my own interpretation of parts of it. That is what Kubrick wanted. The film is a philosophy about humanity and space. A film goer’s version of Being and Nothingness! (The bad faith being HAL himself.) Bowman has a sense of vertigo, or l’nausee, stuck in the space of without a helmet and in danger of losing his life. He is destined to be free but has to make a leap of faith. Jean Paul Sartre would have applauded the film’s existentialism. Up to that point space travel as depicted in the movies had been all about exploring other planets and meeting the most amazing monsters (Forbidden Planet was a film that took creativity that to an amazing level of realism yet once again it dealt with subjects from the beyond that were just too difficult to comprehend.) For all we know this film’s portrayal of the monster from the Id may have given Kubrick the idea one didn’t really need to show one’s adversaries in order to make the story work. The film has several skillful plot jumps (or cuts), for example the animal bone thrown into the sky becoming a spaceship (or space nuclear weapon as some sources claim), the cut between the Monolith and Discovery heading towards Jupiter, and Bowman becoming the Star Child. One can see what Kubrick was doing here. The bone represented living beings (our ancestors) and the spaceship (again as the bone hurtling forward through space) represented the technological advances of humanity, whilst the Star Child was the homecoming of those very bones that had been cast into space. Note how the Monolith within Man’s environment (on Earth/the Moon) is upright, whilst among the moons of Jupiter its horizontal. It mimics the bone cast vertically into the sky before turning horizontal. Its clear there is a recurring theme. Again, the apes/leap of faith/space = humans/leap of faith/Jupiter mission = astronauts/leap of faith/star child. If one read the original book, The Sentinel, and then the book of the film, both by Arthur C Clarke, there were yet more puzzles because none of these really related to the film. Further Kubrick’s team found it technically quite hard to create Saturn (the original destination planet) in the studio sets at Borehamwood. The entire plot of the film was practically changed beyond recognition when the switch to Jupiter (a much easier planet to model) was made. Even then, it was still a hard task to make the film let alone develop its narrative. Sci-Fi films so far had relied upon not terribly accurate representations of what space really looks like. Despite these many difficulties its clear 2001 is a masterpiece. Kubrick had a huge amount of vision and foresight especially as it would be years before CGI even made any impact. Kubrick knew the film was the star. He didn’t need any famous actors to help propel it onwards – although it did bring fame to the then relatively unknown actors, Keir Dullea and Gary Lockwood. Of the three studios used to make 2001: A Space Odyssey, MGM’s no longer exists. It closed not long after 2001 was completed. Kubrick had total occupation of the studios, which inevitably saw film sets ending up at the other two, losing MGM a lot of potential new work. Thankfully Pinewood and Shepperton (the latter at which Kubrick began filming 2001 on 29 December 1965) are still extant. I always wonder what Kubrick meant by ‘The End.’ Obviously a film has finished when the credits roll. The way it is done here is somewhat different. The credits total about seven minutes and each segment is displayed for six to eight seconds. Actually its said the ending credits were designed in such a way as to prompt the crowds to leave! prof premraj pushpakaran writes — 2018 marks the 50th year of Stanley Kubrick’s 2001: A Space Odyssey!! !